Preheat the oven to 400°F. In a medium bowl, toss together sweet potatoes, onion, pepper and 1/4 teaspoon of the cinnamon. Transfer to a parchment-paper-lined baking sheet and roast until tender, about 45 minutes. Meanwhile, whisk together vinegar, honey, remaining 1/4 teaspoon cinnamon and chives in a medium bowl. Toss together arugula and radishes in another medium bowl. To serve, arrange arugula mixture on plates. 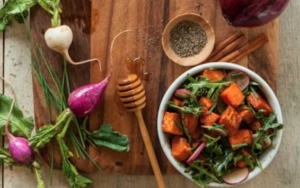 Toss sweet potatoes in balsamic mixture and spoon over arugula. Per Serving: 160 calories (0 from fat), 85mg sodium, 39g carbohydrates, (5 g dietary fiber, 23gsugar), 3g protein.